Well, my final piece of gear came in today. 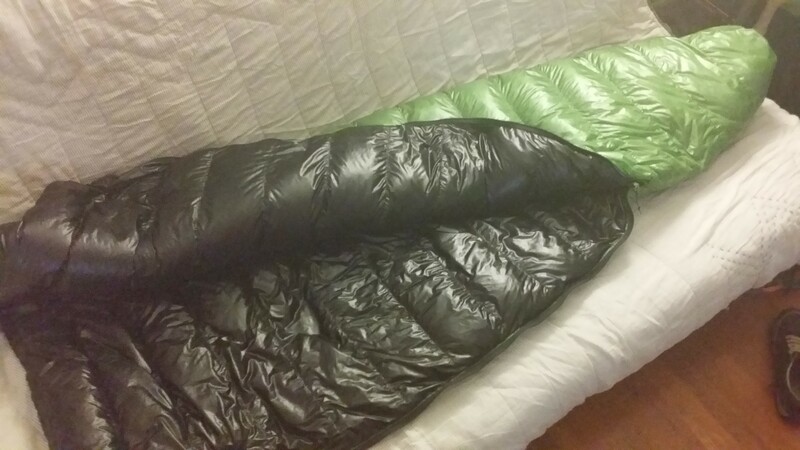 It is my custom sleeping bag by the awesome ultralight gear company zpacks. This is what it looks like and weighs in at a whopping 16.7oz in it’s cuban fiber stuffsack. The down is hydrophobic and the bag itself is water resistant. For the weight, it really cannot be beat. It is, as you would expect, one of my core pieces of gear as part of my ‘primary’ or ‘The big three’ (sleep-system, tent, backpack) and is one of my best weight savings without any sacrifice in usability. My big three is 5.98lbs (that 0.02lbs counts!). I could shave off some weight by getting a different pack, but it would not be a lot, I could also shave nearly a pound with my tent, though I picked my tent for specific reasons and it is still considered very light weight. I may however hack off a couple sections of my z-lite pad. Popping it open you see that is has a draw-string near the top to cinch it up, there is also a zipper-clasp so you don’t mess up the zipper. I wish I had got a picture of the guys at my work throwing it up in the air and watching that it actually had a ‘slowish’ fall, yea, it is that light. This is the large size, I am 6’0″ and this fits perfectly. Yep, I did, I wanted to make sure the fit was right and see how it felt considering that this will be keeping me warm for almost half of this year. For how it was, it is super comfortable, I was impressed. Down has an interesting thing that it does. 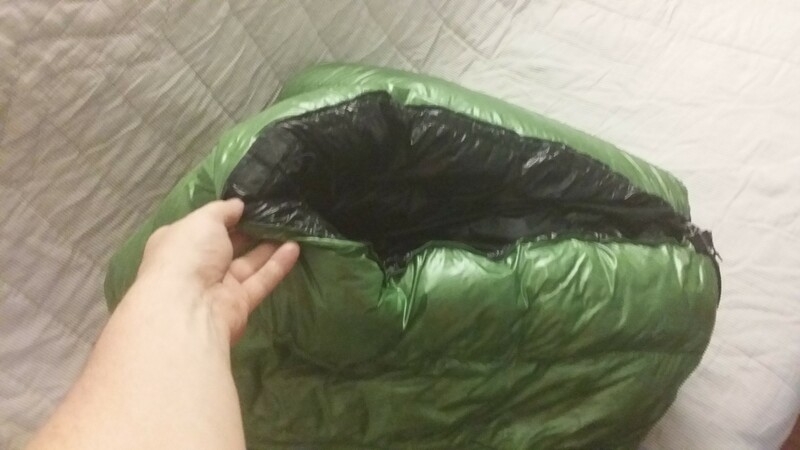 When you get into a down jacket, pants, etc — or in this case — a down sleeping bag, it can be a little flat still and not really all fluffed up on it’s own. However ,after a time being next to your body the down reacts to your body heat and starts to loft up. The more it lofts the more it insulates and thus the ‘warmer’ it is. 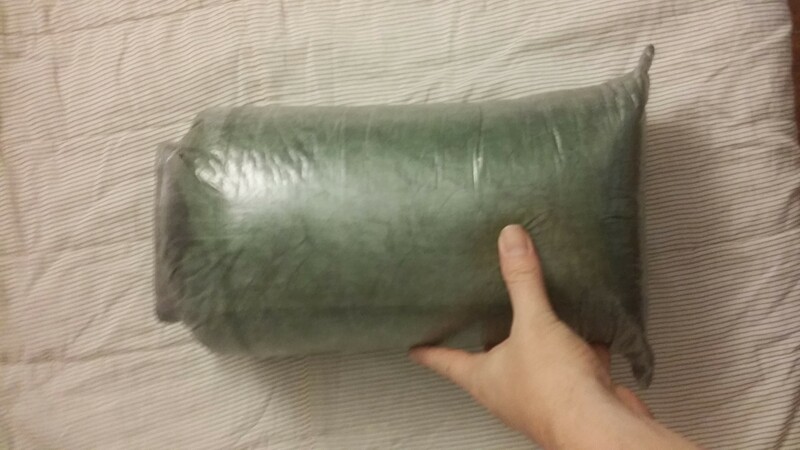 When you get into this bag, looking at it is odd because at first it is sort of normal and then it slowly looks like you are this big caterpillar of green fluff and the thickness is pretty astounding. I stayed in it for I guess about ten minutes and got out because I was getting sleepy. I have no doubts this will keep me warm on the PCT, especially combined with my liner and other clothes. The only thing I am a little worried about is that being so light it feels almost like you are about to rip it just pulling it up around you. I worry that you must take a lot of extra pains and care to make sure it stays in good shape and so I will need to be treating this like my baby the whole way. Though. with all the ultralight gear I have, I have noticed this trend with each one that you need to take extra care with the gear because many times ‘light’ means it is also fragile. I am probably going to keep the stuffsack and not use an eVent compression sack for this just because I want to guarantee that I keep the down in good shape. 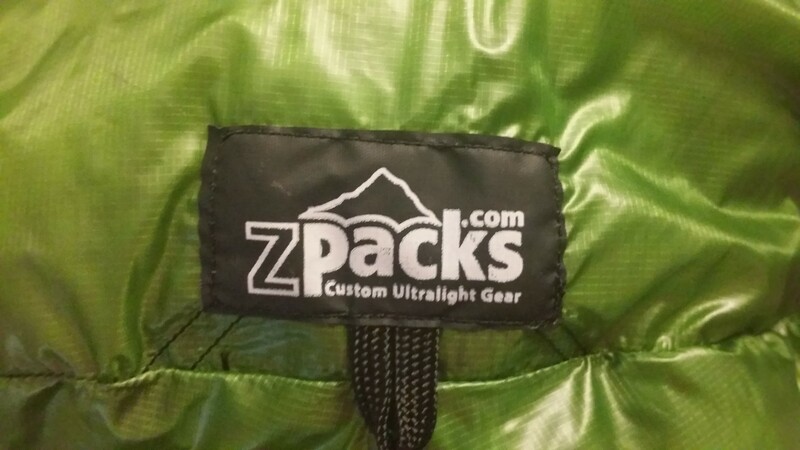 Word of advice: If you decide that you are going to buy items from zpacks or any of the other small custom ultralight gear providers please note that the four months before April is their busiest time of the year, I would suggest getting in an order in November or December to get a jump on the season. This particular bag took over six weeks to get to me. I contacted them and they nicely let me know that they were having problems getting down. Which is partly also do with the fact that every other supplier of down products is also having a very bustling time in the pre-hike gear buying season. 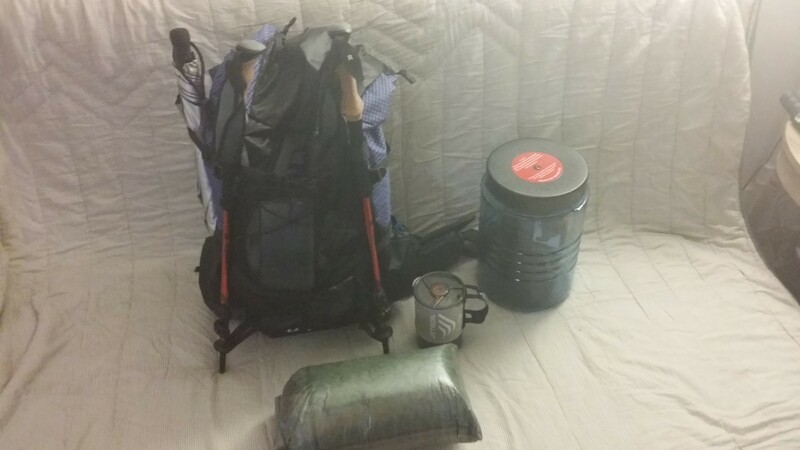 This entry was posted in pct and tagged gear on March 5, 2014 by joeldg. Thanks Joel, I’m a Class of 2015 hiker from Australia and plan to use Zpacks so this is useful info for me…..cheers. And, wooohooooo, not long now!